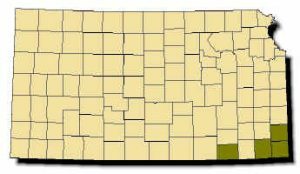 Range: Found in extreme southeastern Kansas in Chautauqua and Cherokee counties and southeastern Crawford County. Description: Harmless. Scales smooth to the touch, but some are weakly keeled beginning on the middle of the back and extending over the rear of the body. 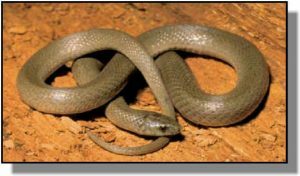 A small gray or light brown serpent with a white or grayish belly. Five scales on each upper lip. Young are miniature adults but may have a yellow area on the middle of the head just behind the eyes. Habits: A secretive reptile, spending its time beneath rocks and debris. Breeding occurs in April or May; from 2-9 eggs are laid from July to September. Never bites. Feeds on earthworms, slugs, and snails.